Already a Light University Student? Register for your first course online today! Save $250 for purchasing all 5 courses at once! You must call to receive the discount. 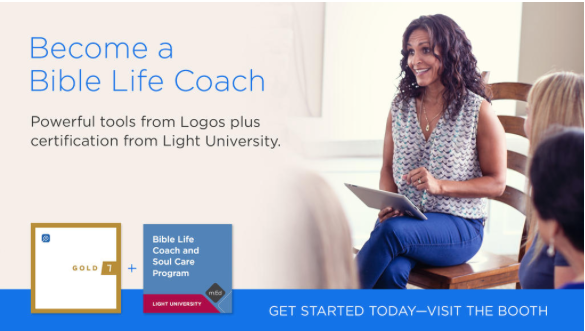 The Bible Life Coach and Soul Care Program of Study, designed specifically to integrate with the comprehensive biblical resources provided free by Logos Software and Mobile Ed, will equip you with the knowledge and skills to help others in their time of need. Bible Life Coaches are prepared for assisting clients with strategic planning activities that offer spiritual direction and formation while utilizing biblical principles in the process. Upon completion of the five Bible Life Coach and Soul Care courses, you will be eligible for board certification through the Board of Christian Life Coaching and have completed the necessary sixty hours of training required for Board Certified Master Christian Life Coach (BCMCLC) credentials. God has no greater plan than to use people of faith as conduits that channel His message of hope and love to the hurting and broken. This course provides the foundational curriculum for a dynamic life coaching ministry by supplying the necessary principles, methods, and applications to help today’s individuals, couples, and families. BBLC 101 incorporates Dr. Timothy Clinton’s PD171 Biblical Soul Care for those who have a passion for helping others and who would appreciate the foundation of Bible-based counseling training. PD171 presents the intersection of psychology and faith in the practice of counseling and explores the increasing need for a response to the stresses of 21st-century American life. This course draws on numerous biblical passages to augment psychology’s explanations and treatment suggestions for a distressed person’s needs and is replete with examples from Dr. Clinton’s experience as a practicing counselor. This course will help you become better prepared for the counseling demands in your ministry and life in general. This course considers a spiritually vibrant life that leads to maturity and reflects personal holiness. The focus is on helping faith-based life coaches understand and communicate the value of genuine spirituality, how the character of Christ is formed in a person’s life, and the practice of experiencing God through the spiritual disciplines. BBLC 201 integrates Dr. Gary Thomas’ PD201 Introducing Spiritual Formation to provide a panoramic view of spiritual formation so you can learn what it means to relate to the God who created us. Dr. Thomas examines the most significant movements in the history of Christian spirituality, such as the Desert Fathers, the monastics, the Puritans, and the charismatics. Use this course for personal enrichment—to survey the sacred pathways, the practice of holiness in everyday life, and the virtue of humility—or use this course to help those in your small group and congregation grow in spiritual maturity. This course introduces life coaches to the coherent, unifying story line of the Bible. The focus is on specific interconnections between the Old and New Testaments, demonstrating the unity of the biblical narrative by tracing theological themes and applying these truths in practical ways to help guide people of faith. The narrative begins with creation at the dawning of God’s kingdom on earth and humanity’s rebellion in the garden. God’s plan of redemption continues to unfold in the remainder of the Old Testament in order to re-establish His kingship on earth through the nation of Israel. BBLC 301 incorporates Dr. Michael Goheen’s BI201 The Story of the Bible and Dr. Darrell Bock’s BI100 Learn to Study the Bible. Dr. Goheen introduces students to the coherent, unifying story line that runs through the entire Bible and shows how the drama of the Bible unfolds by tracing the major theological themes of redemption and restoration across both Testaments. Dr. Bock teaches you how to read Scripture in four basic steps. Then he teaches you how to study Scripture by understanding the original context and the genre it was written in. He describes the social, literary, and historical elements of context; following that, he covers genres, such as narrative and biography, and subgenres, like those in the Psalms. Most life coaching includes elements of counseling and other forms of people helping. In this course, Drs. Eric Johnson, Ken Nichols, and Eric Scalise identify the seven pillars of pastoral counseling, review essential skills needed for effective intervention, and examine issues related to human development. An emphasis is given to the biblical view of God and human nature so that coaches can connect with others in a way that expresses Christ’s love. Both theoretical constructs and practice strategies are discussed for Christian caregiving. BBLC 401 utilizes Dr. Eric Johnson’s CO101 Introducing Pastoral Counseling I: Theory and Practice to identify the seven pillars of pastoral counseling, essential skills needed for counseling, and issues of human development. The course emphasizes the biblical view of God and human nature so you can care for others in a way that expresses Christ’s love. This course offers life coaches an opportunity to learn from veteran Christian counselors who provide examples of how to help those who are hurting and broken, whether due to common struggles or major crises. A biblically based approach to specific problems is explored and studied. Presenters review several dimensions of human beings—biological, psychosocial, ethical, and spiritual—and describe how the Christian coach should approach problems in each area. The course outlines a coaching model that promotes healing and always keeps Christ at the center of the process. BBLC 501 incorporates Dr. Eric Johnson’s CO102 Introducing Pastoral Counseling II: Examples in Application to provide examples of how to help those going through common struggles or major crises. He dissects the four dimensions of human beings and describes how the Christian counselor should approach problems of each kind. Dr. Johnson provides a counseling model that promotes healing and always keeps Christ at the center of treatment.